I hoped to never have to write a post like this, but today’s audio of Los Angeles Clippers owner Donald Sterling talking to his girlfriend about how he doesn’t want African-Americans coming to his team’s games. This is striking a chord all across the NBA, & around the world as well, but sadly, this has been Donald Sterling’s reputation as a owner over the last 30 years since he bought the team in 1984 & moved them from San Diego to Los Angeles. 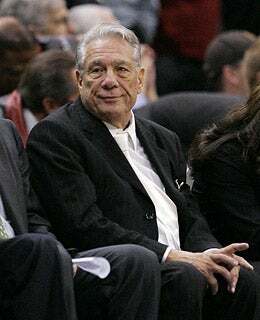 Los Angeles Clippers owner & noted racist, Donald T. Sterling. Sterling made his money in the real estate business in Los Angeles, but seems to have been a dismal owner when it came to owning those properties, as has been noted in various publications such as Deadspin. The argument stems from his girlfriend being berated by Sterling for posing in a picture on Instagram with NBA Hall-of-Famer Magic Johnson, a former Los Angeles Lakers player, part Lakers owner & one of the most influential businessmen in Los Angeles as well as the United States. In today’s world, does racism still exist? Absolutely. And some people will say that the conversation should not have been recorded for people to hear in his personal life, but this just puts over that Sterling is a completely useless NBA owner & sheds a bad light on the league & on humanity as a whole. Maybe Stiviano shouldn’t have released the tape, but what’s done is done, & honestly, its good that we hear this so that the league can get guys like him out of the game that have such an open history of utter bigotry in his business life. Donald Sterling’s girlfriend V. Stiviano. You will hear much about Sterling’s business deals of the past & how he has treated Hispanics & African-Americans in his rental properties, but since this is a sports blog, this needs to be kept in the confines of the sports world. Donald Sterling is a bigot & a racist, & while I am sure we have those people in all of sports that do feel that way, for the owner of a professional sports franchise to have those feelings put out in a public way, whether intentional or not, is a terrible look for the NBA & the sports world in general. Sterling has completely alienated the rest of the NBA, the Los Angeles Clippers organization, the fans & definitely the players, who are majority African American not only on the Clippers, but around the entire league. If the players have any heart whatsoever, there needs to be some kind of public stand against this man & against this man’s viewpoints on race & personal matters. He should have the ability to have his due process in this case, but if the audio above is authenticated the way we all believe it will be, Donald Sterling should be outed as owner of the Los Angeles Clippers & barred from the Los Angeles Clippers & NBA for life.